Chicago, IL – Great Abaco Island, Bahamas — Bahama Beach Club, a luxuriously intimate beachfront villa resort situated on one of National Geographic’s “Top 10 Beaches in the World” is gifting holiday revelers with a trio of festive celebrations. Fete Thanksgiving and Christmas with five-star meals and luxurious beachfront villa accommodations, or ring in the New Year with a gourmet buffet, fireworks and entertainment. For the price of a hotel room, book a private, two- to five-bedroom villa and unwrap a host of world-class indulgences, including access to the famous Treasure Cay Resort and an array of land and sea activities. Overlooking the sugary-soft sands of Treasure Cay Beach, the jasmine-scented setting at the Bahama Beach Club is far from the casino and cruise ship crowds of Nassau and other mega-tourist destinations. This elite oasis prides itself on providing privacy and tranquility along a stunning, palm-dotted beach ranked “The Best Beach in the Caribbean” by Caribbean Travel & Life. 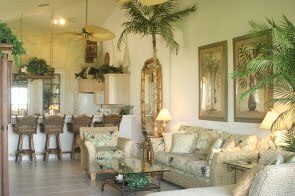 Bahama Beach Club offers the privacy and convenience of fully-furnished, lavishly-serviced villas with the services and amenities of a luxury resort. Defined by British Colonial elegance, each spacious beachfront villa is individually decorated with colorful fabrics and rattan furnishings along with grand master suites, private balconies, fully-equipped kitchens, spacious living rooms and spectacular ocean views. The Club-hosted Thanksgiving Day Dinner includes Roast turkey and honey-glazed baked ham with all the trimmings and desserts of the classic American feast. Cost is $35 per person plus 18% service charge. Children under 12 years are half price. The upscale resort’s concierge can pre-stock the kitchens with groceries, arrange for a chef to prepare a gourmet meal in your villa or in a romantic pool- or seaside setting, book spa treatments done in the privacy of your villa or on the beach to the relaxing sounds of the ocean. Guests also enjoy access to Treasure Cay’s 150-slip marina, championship 18-hole golf course, tennis courts, and the Tipsy Seagull Bar, open nightly for cocktails, camaraderie and dancing. Ideal for romantic getaways or family holiday gatherings, Bahama Beach Club is located on charming Great Abaco Island, which is part of the Abacos, a spectacular chain of about 100 tropical isles known for velvety soft sands, translucent blue waters and laid-back, family-friendly atmosphere. Cars, golf carts, and bicycles can be rented and taxis are available at all times. Many local island restaurants provide complimentary taxi service for diners. Boats can also be rented or you can travel by scheduled ferry boats to New Plymouth on Green Turtle Cay and to Hopetown on Elbow Cay. Divers also flock here for some of the world’s best diving off the Abaco Great Barrier Reef, which includes miles of coral reefs and underwater caverns. The Bahama Beach Club, only an hour’s flight from Miami, is conveniently located close to two international airports: seven miles from the Treasure Cay Airport (TCB) and some 21 miles from the Marsh Harbour Airport (MHH). Rates for a two-bedroom, two-bath villa start at $300 and rates for a four-bedroom, four-bath villa start at $700. Prices include daily housekeeping services, cable TV, air conditioning, and unlimited in-room long distance calling to the United States and Canada, and high-speed wireless Internet. Bahama Beach Club also offers all-inclusive family meal plans. 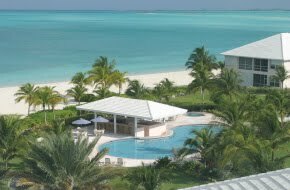 For more information about the Bahama Beach Club, visit www.bahamabeachclub.com in the Bahamas call 242-365-8500 or from U.S and Canada call toll free (800) 284-0382.